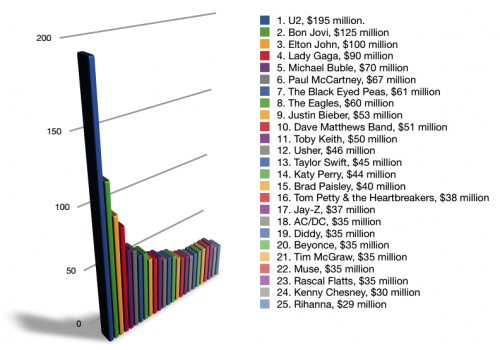 How predictable and dispiriting is the list of top earning musicians released this week? Forbes* staff writer Zack O’Malley Greenburg this week reported the estimated gross (in every sense) earnings of the highest 25 paid acts for the past year. Here’s my take – FWIW. Frankly I find it a rather depressing list, largely dominated by nostalgia merchants for the comfortable middle aged and a few acts created to attract the ever profitable demographic of kids with pester-power. You can’t blame those malnourished consumers, their music diet is terribly restricted by the filters of radio and TV so they never get to hear any of the fantastic music being created in the indie world and are never inspired to get out and try something fresh and vibrant. U2’s touring over the past two years has grossed some $700 million with profits for the past year at $195 million, a cool $70 million ahead of ageing stadium power-ballad “rockers” Bon Jovi. Even poor little Rihanna, last on the list, pulled in $29 million and was grossing over $1 million for each of the 38 shows she played last year. For most of these high earners touring was the most significant source of income. How different for independent artists struggling to pay their bills at a time of rising costs where touring can represent a massive drain on resources and is sometimes seen as a necessary expense of promoting recordings. OK, so not all that big money reaches the artists. Managers and agents take their fees and, for those admitting residency in their own country, paying taxes takes a fair bit. But, however you look at it, there is $1,441 million going to just 25 artists. You can’t help wonder how much good could be done with (say) just 10% of that to develop and promote the cause of independent music to reach and enthuse a wider audience and thus build a few more sustainable careers for artists that really deserve them. I’m not talking about distributing $1.4 billion to indie musicians but perhaps finding a way to enable performance and raise awareness, among the population, of the riches of indie music. So I wonder what we would do. Ideas?